America’s Cup in Danger! And Now the F1? »« Let the Beach Season Begin! 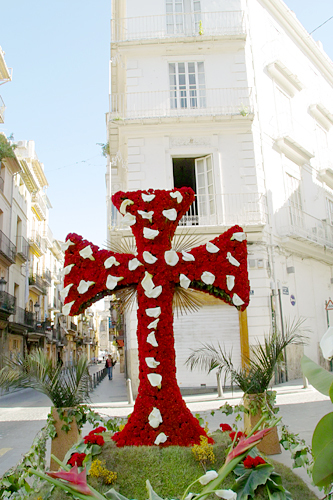 During the month of May, you won’t be able to miss the beautiful crosses adorned with roses placed throughout the city. Actually you might be able to miss them — we didn’t notice them at all last year. But now we’re finding them everywhere. Can’t take a step without tripping over another frigging cross! 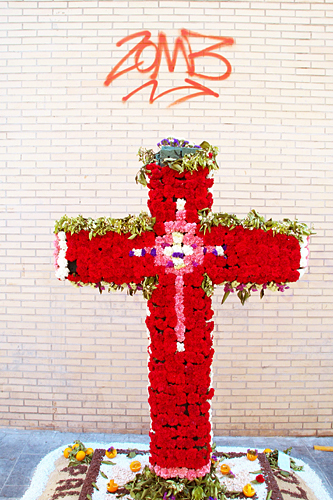 The crosses are put up by festival groups, predominantly Fallas commissions, and are — like almost everything in this city — part of a competition. 84 crosses in Valencia compete for the Premio Extraordinario, which was won last year by the Falla Plaza de la Cruz in Cabanyal (location). What’s the point? Besides the simple joy of wasting money on beauty, which Valencians seem to revel in, the crosses commemorate the supposed discovery of Christ’s cross by Saint Helena of Constantinople.